Who Actually Was Supreme Leader Snoke in 'The Force Awakens'? There are a lot of familiar faces in Star Wars: Episode VII, from Han Solo and Chewie right down to series stalwarts R2-D2 and C3PO. There were callbacks and references, X-Wings and even something that looked an awful lot like a Death Star. There were also a few new additions – mostly in the film’s young new leads Rey and Finn, not to mention everyone’s favorite emo Sith Lord Kylo Ren. 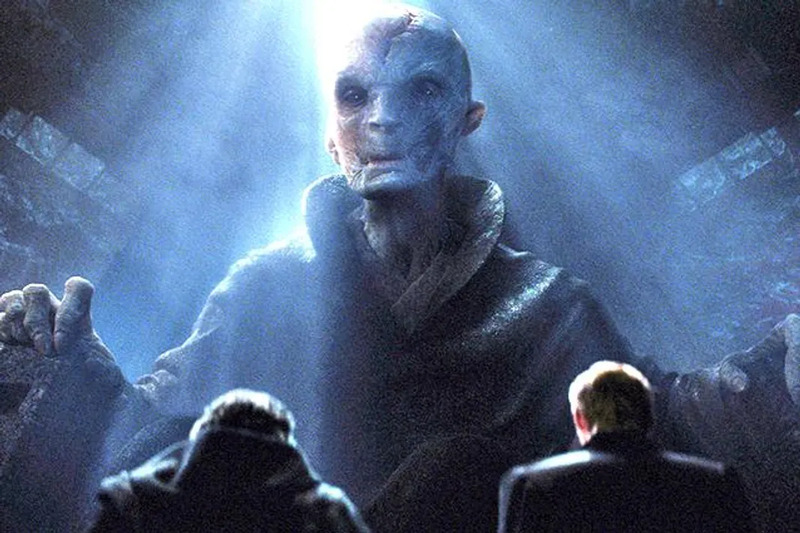 Of all the new additions though, there’s only one that’s sparked widespread online debate and intrigue: Supreme Leader Snoke, who some fans think isn’t quite as new to the series as he first appears. You’d be forgiven for not remembering Darth Plagueis if you don’t have encyclopaedic Star Wars knowledge. He only got mentioned on-screen once, and never seen directly, and it was in one of George Lucas’s unpopular prequels, so it’s easy to forget. Then-Senator Palpatine (soon to be Emperor) tells Anakin of the powerful Sith Lord, someone with such vast knowledge of the Force that he was able to conquer death itself, to keep his loved ones alive – just the sort of nudge Anakin needed to be pushed over to the Dark Side. Did you notice that I needed to devote two whole paragraphs to explaining who this guy is? Even most Star Wars fans don’t remember him, so what are the odds much of the moviegoing public will? And if they’ve never heard of him, they’re sure as hell not gonna care about his reveal. The Force Awakens drew liberally from the original trilogy. It pretty much ignored the prequels entirely. Fans hated them, critics hated them, most people have basically forgotten them. It seems pretty unlikely that Disney would want one of their biggest reveals to hinge on a single forgotten monologue from the derided trilogy. JJ Abrams has already revealed that Snoke was one of the last character designs to be finished – and even though Andy Serkis was cast for the part, the villain was still so much in flux that they almost made him female. Darth Plagueis was confirmed to be a dude, so it seems pretty clear that Abrams can’t have had him in mind if he was toying with making Snoke a lady. In an interview about the part, Andy Serkis has already said that Snoke is someone “entirely new.” And sure, he didn’t write the movie or anything, but as the guy playing the character, you’d think it’d be the sort of thing he’d know. This really should have settled it, except Abrams has been known to lie about his twists before (see: Star Trek Into Darkness). At Comic-Con he outright told fans that Snoke wasn’t Plagueis – and screenwriter Lawrence Kasdan didn’t seem to have even heard of the minor character.